Today we are taking a trip down memory lane. This is the third in the series I’m calling Flash Back. The original post was shared way back in May of 2012. I hope you will find it as informative as I do. How will my quilt be used? Will it be a wall hanging or bed quilt. If I am using it as a bed quilt, how warm would I like it to be. Do I want to do hand or machine quilting? How much quilting do I want to do? Do I care about quality? Did I use light or dark fabrics? How big is my quilt? This sounds like a lot of questions but they’re all very important. Your answers to those questions will help you make your choice. Carded or combed fibers have no bonding agent therefore are more prone to shifting and bearding. 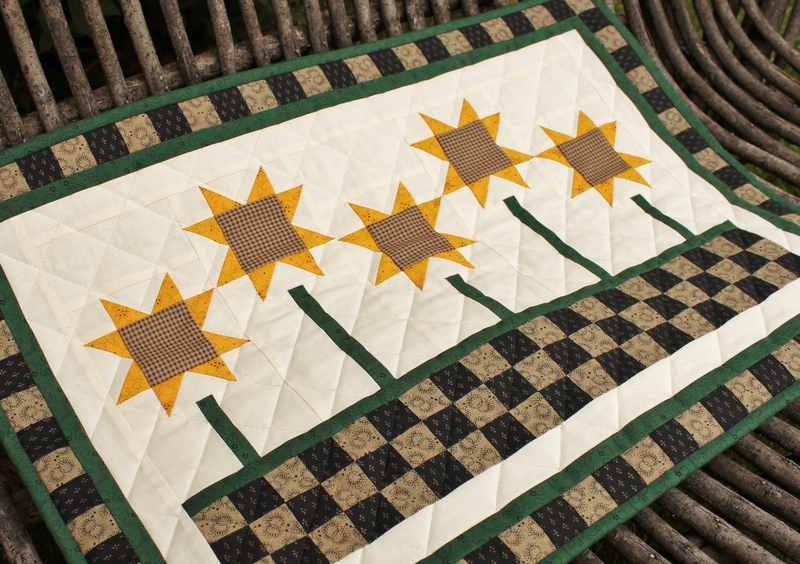 As a result the quilt lines on this batting should be between 1/4″ and 1/2″ apart. There are two types of bonded batting, resin and thermal. The processes are very different but the reasons are similar. Bonding is done to help prevent bunching, eliminate thick and thin areas as well as bearding and provide extra strength to the fibers. Bonded batting has a higher loft than needle punched because the fibers of the needle punched batting are compressed. Resin bonding is a thin coating of resin or glaze applied to both the top and bottom layers. This type of batting is great for comforters and quilts that have less quilting. Thermal bonding is typically done only on polyester batting. Thermal bonded batting is softer than resin bonded batting, but not as durable and may tend to be more susceptible to bearding. Needle punched batting is just what it sounds like. The fibers are punched with thousands of needles. The punching tangles the fibers together, thereby compressing them. The tangling process adds durability. Some needle punched battings also have a scrim. A scrim is a netting type material that is added while the batting is needle punched. The scrim adds even greater strength. Lightweight scrims are easily hand quilted. Heavyweight scrims are more suited to machine quilting. A heavyweight scrim makes the batting stiffer but less . Now that we’ve explored the process of bonding lets discuss the types of fibers. Battings can be made from natural fibers, synthetic or a blend of both. Fibers that fall within the natural category are: alpaca, bamboo, natural cotton, organic cotton, cotton flannel, flame retardant batting, a flax and linen blend, silk, soy blend or wool. Synthetic fibers are made from: polyester, plastic, a cotton/polyester blend and a cotton/polyester blend with stabilizer. Lets look at each one a little closer. Care: Can be machine or hand washed. Do so with care. Agitation can result in felting. Air dry. Shrinkage: 3-5% when washed. Once washed will keep its shape and no longer shrink. Some are needle punched. If needle punched may have a scrim. Scrim would make it more stable, less stretchy. Scrim could make it slightly harder to hand quilt. Fusible web is temporary. Dissolves when washed. What you have just read barely scratches the surface of available information. I didn’t even attempt to compare the various manufacturers and brand names. Doing so would have sent my head spinning. If you would like further details you can find numerous websites with even more data. Feel free to go on a search and discovery mission of your own. I hope that you have found this information helpful.